I was sorely tempted after reading Cate’s blog – this looks like a hoot! But really, how many socks will I knit before madness takes it’s toll? I am cheering for Cate ‘tho – may the force be with you! Last, not least, I’ve tried to jazz up my blog a little. I had no idea when I started this a few months ago, how much fun it would be. Actually, I was a bit of a “Blog Snob” for a long while, it seemed like so much navel-gazing. Who knew it would become such a fun way to add to the entire hobby experience! I’ve got most of my links up to date, and some new KAL’s added – one that will involve real (lace!) knitting. Hope the new look is appealing and ultimately more readable. It’s easy to overdo all the blog toys. If anyone can help me with placing pictures side-by-side and adding albums with Blogger (is there such a thing? ), I’d be so grateful. Karin, your blog looks wonderful! (It looked great before, too) I noticed the change right away – quite striking! Your blog looks great! The banner is awesome! 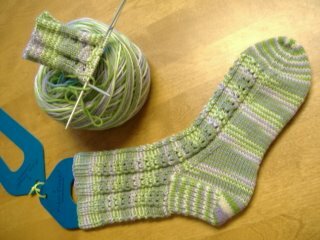 Karin, Your blog looks so nice and so does the sock! I can’t wait to see what you’ll knit up when your elann white box gets to you. I managed to be strong through Katrina, but then I saw Canapone stock levels dropping and placed an order on Friday, despite my own starving student status.